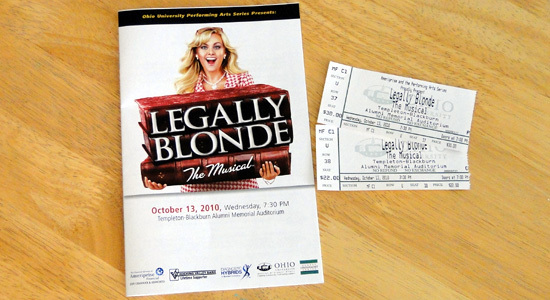 Tonight Sarah and I went to see Legally Blonde: The Musical at the Ohio University Templeton-Blackburn Alumni Memorial Auditorium in Athens. We saw Jenny and Sally in the crowd. And Charlie and Gloria were there too... someplace. The show was full of music and comedy. The second act was especially funny. The show moved along at a good pace. I had not seen the movie, so I didn't know the story at all. Sarah and I had a great time.